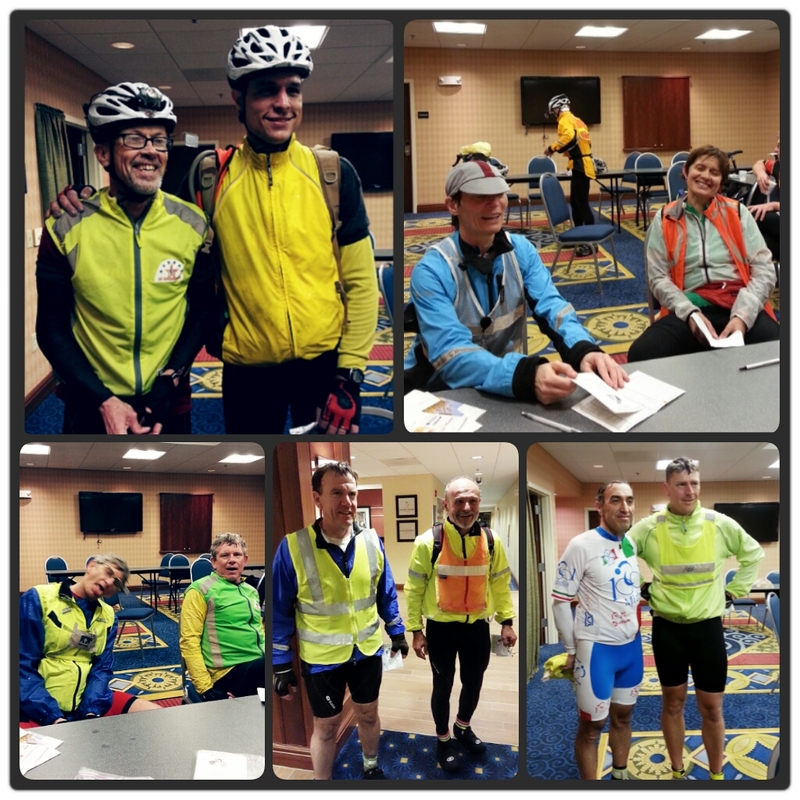 This past weekend Felkerino and I organized the D.C. Randonneurs 400K brevet. Of all the spring brevets the 400K is the one that, as a rider, I find most daunting. It starts at 4 a.m., and is the first of the brevets that requires hours of night riding. Riders roll out in the dark, and arrive in darkness, too. 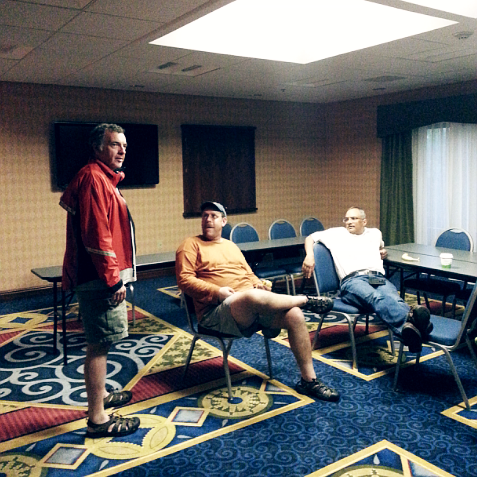 I overhead the staff at the hotel where we staged our ride called our 400K a pizza party. That made me laugh. If the 400K could be considered a pizza party, it’s likely the most hard-earned pizza you’ll ever eat. This brevet was particularly challenging due to the dreary weather. Riders set off under dry skies, but that ended about an hour into the event and the remainder of the time was spent riding in rain, drizzle, a stint of no rain, more rain, and more drizzle. During the later evening hours, the rain let up and mist filled the sky, fogging up people’s glasses and making nighttime visibility more difficult. The up-side of the day was that it was not terribly cold, although the temperatures did not allow riders to stop for long without getting chilled. Winds were also light for most of the route. This course, called the “Firefly 400K,” was originally run in 2011. It is a loop that starts in Warrenton, Virginia, meanders down to Charlottesville, and back. Overall, the terrain is rolling with no major mountain climbs. That’s not to say that it is an easy course, only that there are no real mountains on it. Twenty-six people came out for the event, and all but four riders finished within the time limit. Those who abandoned or did not officially finish all made it back to the hotel under their own steam. Felkerino and I organized the club’s 400K last year as well, which ran out of Frederick, Maryland. While I preferred the Frederick course, we encountered logistical issues with start and finish locations, and moved the ride to Warrenton this year. 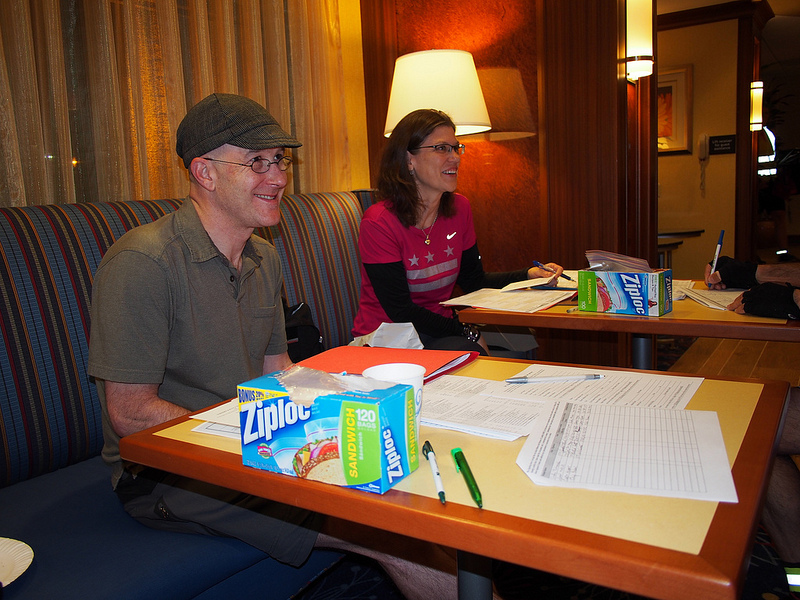 George Moore and Nick Bull pre-rode the course last weekend for us, and helped us in preparing the ride materials. Thanks to both of them for checking out the ride and being there for early morning bike inspection. It felt strange for Felkerino and I to not pre-ride the course ourselves, but we are taking a break from the “big rides” this year. More on that some other time. Everyone who attempted the ride on Saturday has my admiration. The weather made an already challenging 252-mile ride that much more difficult. I know there are those few people who like to exclaim their love for riding in the rain, but I am not among them. I’ll take a sunny day over a rainy one almost any day. I’ve been riding regularly with the D.C. Randonneurs since 2005, and it’s been educational to see what organizing a ride entails. Until organizing, I took a lot of the behind-the-scenes work for granted. I’ve gained a real appreciation for all the brevet details that must be managed. Control cards and cue sheets need to be made. A pre-ride of the course should be done. 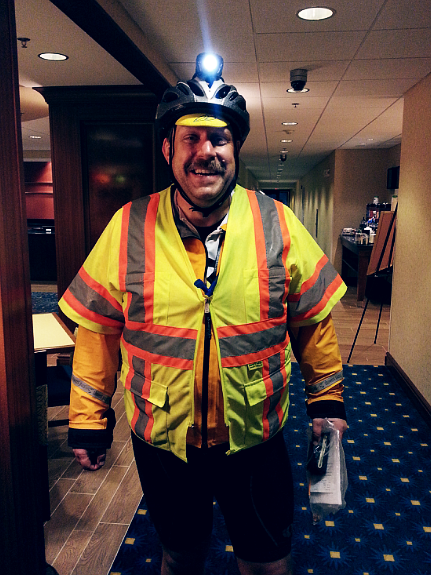 Volunteers need to be in place to register riders and inspect bikes for appropriate lighting and reflectives. Food and supplies need to be purchased and set out. Most importantly, you need the pizza place on speed dial so that you can offer riders food at the end of that long effort. Over a 400K distance, the field becomes quite spread out. Riders have 27 hours to complete the course. This year, people finished in small groups of ones and twos between 9:30 p.m. until just before 6 a.m. The 400K is an all-night pizza party, you see, not a slumber party. Organizing a ride is work, but it’s fun, too. It’s interesting to see all the riders in their various stages of lucidity before the ride start. Everybody has their own way of approaching these early mornings. Some are outwardly excited and chat animatedly. Others are solemn and mostly silent. I see some riders who focus intently on their stuff, packing and repacking to make sure they have everything they need for the long day ahead. After hours of waiting in between the roll-out and the final miles, the last control is also an exciting place to be. It’s a thrill to see riders successfully finish such a long ride. People are in various physical and mental states after riding that far. Between Saturday night until Sunday morning I saw riders who just wanted to finish and immediately head off for a shower and sleep, and I also hung out with those who wanted to catch up from the last time we saw each other and relive some of the day’s experience. A friend of ours once described volunteering at a brevet finish like being at a party where everyone is tipsy except for you. I see what he’s saying. The 400K is a big accomplishment, and there is something indescribable that’s released during the finish. Take a combination of endorphins, relief from being done, the physical exertion from riding from 4 a.m. until dark and then some, and add a little sleep deprivation and you’ve got one goofy 400K pizza party. Going from rider to organizer you interact with riders that you might not otherwise, due to your differences in pacing and style. For Felkerino and me, that meant we got to share a little bit in everyone’s ride. Several riders completed their first 400K this past weekend. Of those, I want to give a special shout-out to our rando-buddy Mike Binnix of Severna Park. Mike attempted a 400K last year, but was unable to go the full distance. This year, I knew Mike was going to make it. He had unfinished business with the 400K and I could hear in his voice when we talked at registration that he was all in on this ride, determined to finish. Twenty-six hours and 252 miles after departing Warrenton, Mike finished his first 400K. Well done, Mike. I’m really happy for you! Congratulations to everybody who rode this weekend and to all the finishers. Thanks for letting us be part of your adventure. 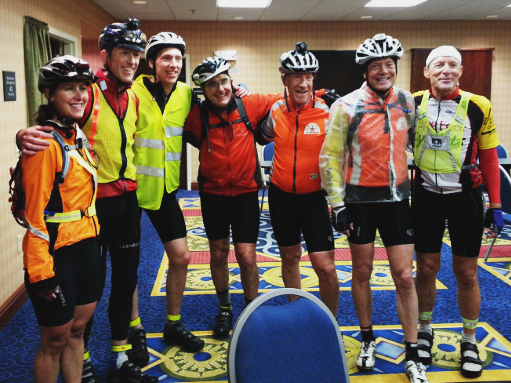 We had a great time hosting the 400K brevet and pizza party. Sounds like everyone had a great time! Awesome that you both stepped up like that. I’ve volunteered at the start and at the finish. Organizing a Brevet is clearly at an entirely different level. Great job! On a personal not, I found Mike B’s story particularly inspiring. I got a little sidetracked last year with injuries and health issues so my goal of getting through randonneur series was sidetracked.The furthest I’ve done so far is a double-century and that was last year right before I was hurt. I’m back riding now, and about to try my first 200K DART in a couple of weeks. I’d really like to get a 400K done this year. There are a couple of opportunities left this year to get a 300K and maybe even a 400K in. Crossing my fingers that I can do it! I’ve joined the SF Randonneurs and am amazed at ALL they do. Sun. I rode my first event and the owner of the Permanent, and his wife came out to ride with us. Lead the whole way, pulled in the winds, and gave us words of encouragement. PRICELESS. congratulations to all who rode!! Sounds like my kind of fun. I really must get my behind in gear and ride a brevet! Forgive me for not showing up. I am recovering from a bike accident at a hospital in DC. Transferred to host in NE dc, near Children,s, from geo washington on Friday. Needless to say has not been pleasant, but should have tried harder to notify you. really soRry I missed the brevet. so sorry to hear about this! Where are you so we can come see you?